Even though I consider myself an Italian girl, I am in fact, part German, among other things. Oktoberfest is an autumn festival held in Germany in late September and October. I could not let the celebration pass without sharing a recipe that celebrates my German heritage. 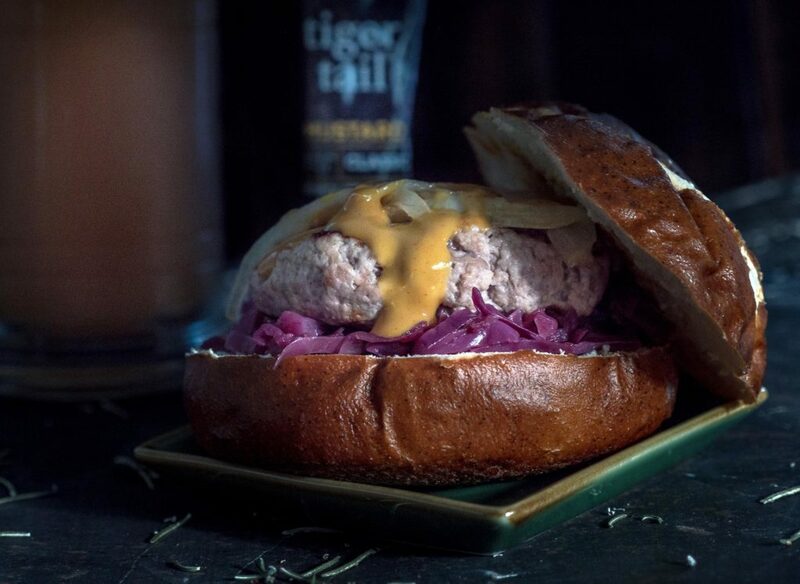 Served on a pretzel bun, these pork burgers are seasoned just like bratwurst and topped with tangy German red cabbage (rotkohl), sautéed onions and a sweet beer mustard sauce. This one recipe combines all of my favorite Oktoberfest food flavors into a burger form that, of course, pairs well with beer. There are a lot of steps for this dish but don’t let that deter you. They aren’t difficult, and they are well worth it. I highly recommend serving these burgers with your favorite beer. Prost! Melt 2 tablespoons of butter in a Dutch oven over medium-high heat. Add the onion and sauté until translucent. Toss in the shredded apple and red cabbage. In a small bowl, whisk together the apple cider vinegar, water and sugar. Pour over the cabbage mixture in the pot. Add the cloves and bay leaf. Stir to combine. Place the lid on the pot, reduce heat to medium-low and cook about one hour. Stir occasionally. Melt 1 tablespoon of butter in a small sauté pan over medium heat. Add the thinly sliced onions and sauté until soft or slightly caramelized. Set aside. In a large bowl combine the ground pork, sage, paprika, cayenne, dry mustard, coriander, rosemary and salt. Form into 4 burgers. Heat the grill on medium. Cook the burgers (flipping once) until they reach an internal temperature of 160 degrees Fahrenheit. While the burgers cook, in a small bowl, whisk together the yellow mustard, paprika, honey and beer. Set aside. On the bottom half of each pretzel roll, add some red cabbage, then place on a burger and some of the sautéed onions. 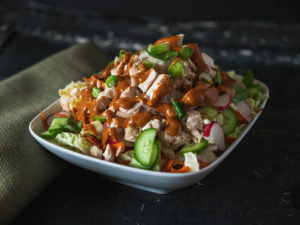 Pour some sweet beer mustard sauce over the top. Add the bun top and enjoy!